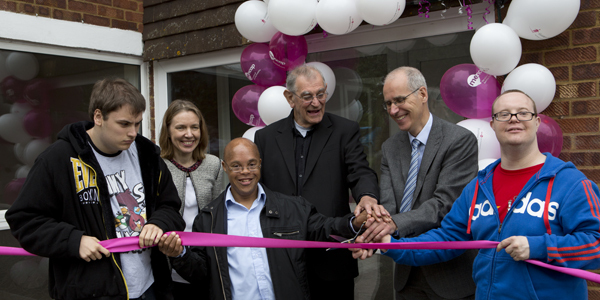 GLH has now bought 27 properties providing independent living opportunities for 99 people with a learning disability supported by Mencap. Launched in 2013 the GLH Bond was the UK’s largest ever charity bond issue of its kind. It was oversubscribed by people wanting to invest in a bond that gives a social as well as financial return. James, Bryan, Danny and Ryan the four new tenants with a learning disability have moved in to their brand new five-bed property on Monday 2 June 2014. The property will have room for five tenants and one sleep-in support worker, with all rooms being provided with en-suite bathrooms. Buckinghamshire County Council provided support with the design of the accommodation, and it has entered into a nomination agreement to ensure that the service is fully occupied. “We are delighted to welcome the new tenants of our final home purchased through the 2013 Bond. Thanks to all the people who invested in the bond making this possible and to Buckinghamshire County Council. Also a massive thanks to the dedicated staff of GLH and Mencap and our contractors – the transformation is amazing, they have done a fantastic job. Most of all thanks to our tenants!” said Alastair Graham, director of Golden Lane Housing. James, Bryan, Danny and Ryan previously lived in a Mencap residential care home at Lee Road but are now excited to have moved into their new property. “I will miss Lee Road but I think I am going to like it at my new house. My room is much bigger and I am glad I have my own ensuite and that I got to choose the colour – it’s yellow. The house is so big that I will be able to have my friends round. I was worried that my support staff would not support me anymore, but they are coming with me, so it is great!” said Danny, one of the new tenants.